As my buddy Fitz will testify, I burn through new hobbies like flies on a hot dog. When I got my extra-class amateur radio license only six months after starting the hobby, my co-workers asked me if I had “won yet”, and asked to see my “achievement badges”. I guess there’s some truth there. My job at Google requires that I do about 8-10 short trips per year (to other offices or conferences). Back when I was in my banjo phase, I obsessed about carrying a banjo on every plane so that I might seek out local bluegrass jams (I even had a folding banjo!). In my photography phase, I carried a giant DSLR and heavy lenses in my carry-on bag, and would taking photographic walking tours of each city. 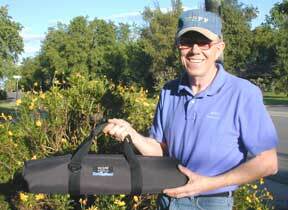 And now, in the era of Ham Radio, I obsess about how to carry an entire portable radio station with me in a gymbag. My homemade touch-paddle/keyer combo for doing morse code. A 5 amp-hour 12V battery, to power the radio and tuner via powerpole connectors. My brand-new, supremely flexible Buddipole Deluxe antenna construction kit. The final gymbag was ~20 pounds, and was thoroughly swabbed and inspected by the TSA in both directions of travel. I guess they’re ok with sealed lead-acid batteries, because, well… they’re sealed. The real star of this writeup is the Buddipole. After my own homebrewed antenna experiments failed to pan out in hotel rooms last autumn, I discovered this product. It’s not so much an antenna, but an erector set for improvising any sort of antenna you wish. It comes with a fantastic cookbook (written by fan NE1RD) that shows a zillion different tested configurations. Within a tiny little 2-foot long bag, you get a tripod, 10 foot mast, multiple radiator elements, counterpoise wires, guy lines, and changeable coils. The idea is that you can build a straight horizontal dipole (up to 26 feet long! ), and “tap’ the coils to change the electric length. 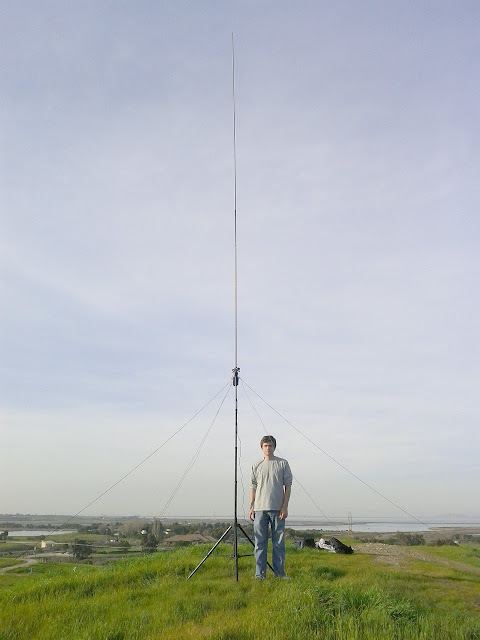 Or you can build a vertical antenna, with either rigid or wire counterpoises at random angles. Or you can make up your own Y or L shaped designs — whatever works for you! With an antenna analyzer at hand to adjust your invention, you can get it tuned perfectly. Or if not tuned perfectly, the autotuner helps span that last little bit of impedance mismatch. Hams love to see how far they can reach with their signals — what they call ‘DXing’. They also love to take trips to remote islands or jungles and set up portable stations, what they call a “DXpedition”. 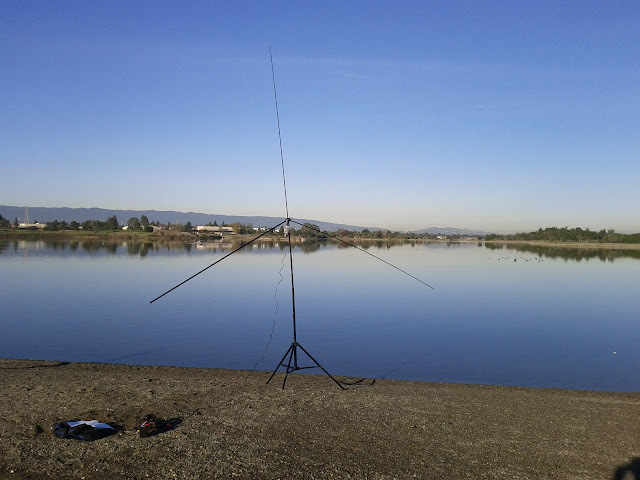 My own DXpedition started when I got up at dawn and headed over to a tiny salt-water lake in the public park just north of the Google campus. 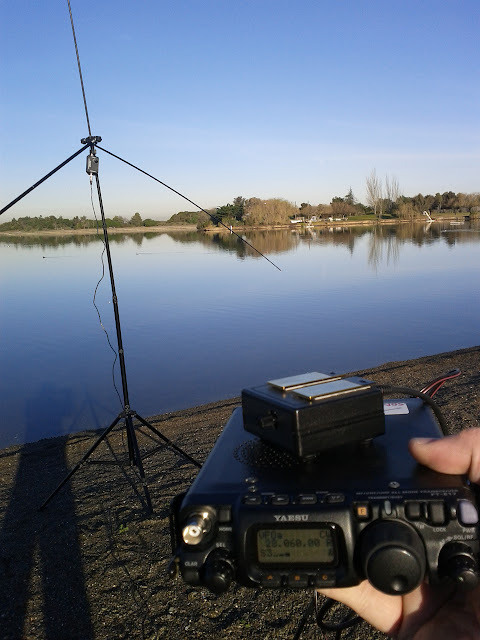 Some folks at Ham Radio Outlet had recommended it to me, since an antenna over salt water gives nearly perfect ground reflection. I showed up and started by building a 10 meter vertical antenna, with two 30 degree counterpoises. And here you can see me holding the tiny radio, hooked up to the antenna. Alas, the 10m band was mostly inactive, and I had to start my workday. So after 7 hours of meetings, I teamed up with another ham co-worker (N1VF) and we scaled the hill just between the campus and the lake. Quite a view up there! 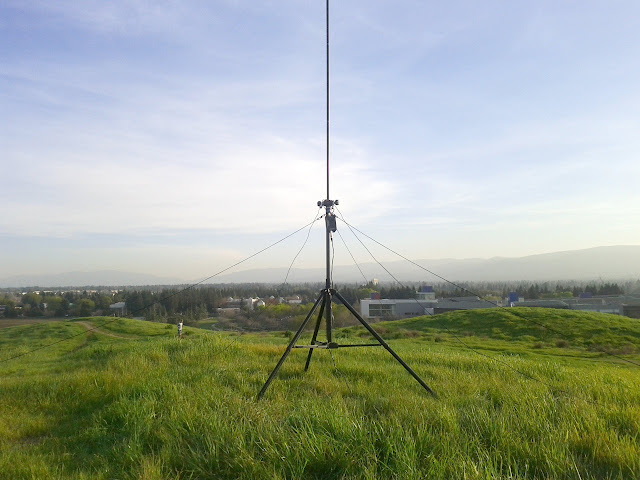 We then built a full-sized half-wave 20m vertical antenna, since vertical antennas tend to have low takeoff angle and hit the horizon better than horizontals. Of course, on the hilltop we already had a 360 degree view of the horizon. 🙂 In the photo below, you can see my buddy next to the antenna. We have 3 guy lines coming off of it, and 2 wire counterpoises (about 17′ long each) drooping down to the ground. 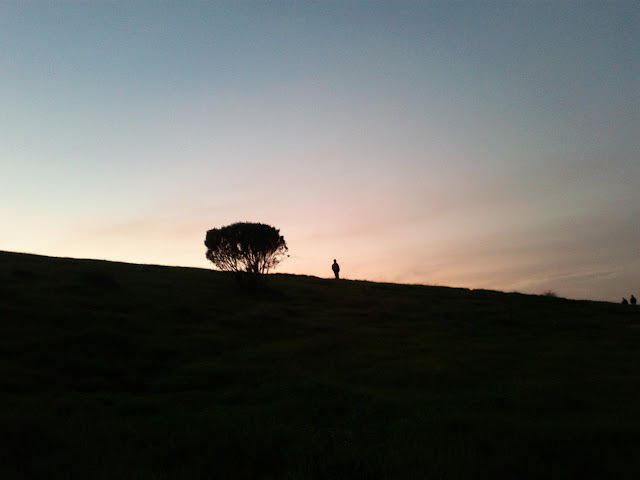 We then sat on the hilltop for an hour, as the sun slowly set over the ocean. Nobody replied to our CQ hails on morse code, but we did hear a guy in Colorado talking to a guy in Australia, both with directional beam-antennas. Pretty neat. Eventually we made voice contact with a guy in Wisconsin; apparently he was able to pick up our tiny 5 watt signal because he too had a beam-antenna pointed towards his friend in Hawaii. The highlight of the hour, however, was when we made voice contact with a ham just outside Fairbanks, Alaska — that’s about 2500 miles away. For 5 watts, not too shabby! After packing everything away, I managed to grab a snapshot of the setting sun as we went down the hill. Overall, I consider the expedition a success. Alaska is a hard state to “achieve” in the game of ham radio, and I’m proud to have it in my logbook. The Buddipole really impressed me to no end. I will heartily recommend it to anyone who ever travels, camps, whatever. I plan to use it quite a bit for Field Day next June.